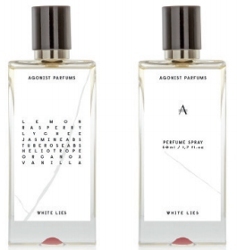 Swedish niche line Agonist Parfums will launch White Lies, a new fragrance, in November. A seductive scent that seduces you and everyone around you. Like a white lie it entices you yet holds a promise of a deeper truth. With a fresh and tempting top of Lemon, Rasperry and Lychee, it drags you in to a heart of Jasmine, Tuberose and Heliotrope. The deep and sensual notes of Patchouli, Orcanox and Vanilla in the base makes the composition truly unique and impossible to forget. Agonist White Lies will be available in 50 ml. But then again, it may turn out considerably nicer than your average sweet fruity floral. I am behind on Agonist — I did like a few of their early scents but no idea what they’re doing these days.